The cranium of the juvenile skeleton of Australopithecus sediba. One August day in 2008, a pair of nine-year-old boys crossed paths at a cave in South Africa. The boys didn't play, didn't speak, didn't even smile at each other. One of them was Matthew Berger, the young son of paleoanthropologist Lee Berger of the University of Witwatersrand in Johannesburg, accompanying his dad into the field for an expedition. The other boy was known only as Australopithecus sediba, a pre-human child who died 1.977 million years ago, leaving only his fossilized bones behind. The site, 30 miles northwest of Johannesburg, had been visited before and other bones had been found, but the remains Matthew stumbled across, along with those of an adult female, are the subject of no fewer than five papers in this week's issue of the journal Science  and with good reason. The skeletons are both in remarkably good condition: a hand and a pelvis are the most complete for a hominin ever found; the ankle bones and one of the skulls are nearly as pristine. Feet, hands and heads are where walking, tool-making and thinking reside  the very features that most conspicuously separate us from the apes  and the flock of new papers show that Australopithecus sediba was starting to separate itself indeed. This suggests a whole new transitional species between long-ago pre-humans and modern Homo sapiens. "Sediba is turning out to be one of the most intriguing hominins ever discovered," says Berger. "It certainly shows a mosaic of features shared by both earlier and later hominins." The evolutionary trudge from ape to human was a long and complex one, but most of the milestones are familiar by now. Australopithecus  the genus that includes little Lucy  was the top-of-the-line model from 2 million to four million years ago. She gave way to Homo habilis  or "handy man," named for its sophisticated grip and toolmaking skills  about 1.9 million years back. Habilis, in turn, gave way to Homo erectus, from 1.8 to 1.3 million years ago. Homo sapiens got into the game comparatively late, just 200,000 years ago. The tight fit between Homo habilis and Homo erectus didn't seem to leave a lot of room  or suggest a lot of need  for another transitional species. But the discoveries in South Africa, in a World Heritage Site known appropriately as the Cradle of Humankind, changed all that. In total, 220 bones belonging to five individuals were found in the 2008 trove. It took three years to conduct a good analysis of just two of the skeletons, but the results were worth the wait. For starters, there's what the work revealed about the sediba brain. Soft tissue does not survive the decay and fossilizing process, but the brain leaves indelible fingerprints behind all the same, thanks to the snug fit of the cranial bones that surround it. "With every heartbeat, the brain pounds out its shape on the developing skull of the child, eventually leaving a beautiful impression of [its] external shape and form," says paleoanthropologist Kristian Carlson, another co-author. Take an endocast  or mold  of that impression and it's as good as holding the brain in your hand. Computer-generated endocasts of the sediba brain show that it was surprisingly sophisticated, with its frontal lobes  particularly the orbitofrontal region, directly behind the eyes  developing a close resemblance to ours. This suggests that it was already reorganizing itself for abstract, human-like thought. Its olfactory region was also repositioning itself to a spot more consistent with the arrangement of the human brain. Despite that, the sediba brain was a modest grapefruit-size, only about 10% larger than a chimp's and nearly four times smaller than ours. Not only does this make a hash out of the accepted theory that the brain could not become more sophisticated until it got bigger, it also casts doubt on what's been known for the past 30 years as the "obstetric hypothesis"  the idea that big human brains, and the big human heads that resulted, are what's responsible for the unusually deep, bowl-like shape of the human pelvis. There's simply no way a baby noggin could move through the birth canal unless human females evolved the orthopedic architecture to accommodate it. But sediba calls that sensible-sounding idea into question. Its skull may be small, but the pelvis of the female was already human-like, without the flat, flaring look of those belonging to other Australopithecene. That may have conveniently helped it manage the big heads that would come along hundreds of thousands of years later, but it did not evolve for that reason. "Parts of the [sediba] pelvis are indistinguishable from that of humans," says Job Kibii, also of the University of Witwatersrand. "At least in this lineage, the obstetric hyothesis...is wrong." Human-like too are sediba's hands and feet. The ankle joint suggests a range of motion and relative load-bearing ability similar to ours; the foot reveals a human-like arch and a similarly familiar attachment point for the Achilles tendon. The tibia also fits into the foot in a way that would have made upright walking likely. The heel bone, however, is even more primitive than Lucy's. 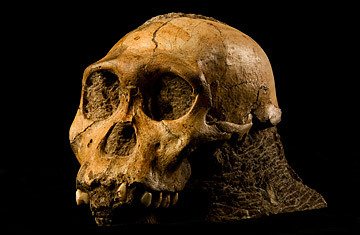 All of this, says co-author Bernhard Zipfel, indicates that sediba practiced a unique form of upright walking, not exactly like that of humans, with some degree of tree climbing. And then there are the hands. Nothing says human  or at least fancy pre-human  like opposable thumbs and a precision grip, and sediba had both. Apes have longer fingers and shorter thumbs than humans, which is the arrangement needed for tree-climbing. Sediba  like us  reverses that, with a longer thumb and shorter fingers, just right for manipulating and making tools. Indeed, sediba's thumb is actually longer than ours, relative to the size of its fingers. "Sediba has more features related to tool-making than...the hand that was used originally used to define the 'handy man' species, Homo habilis," says Tracy Kivell, a researcher in the department of human evolution at the Max Planck Institute in Germany. None of this means that sediba is the final word on the critical transition point from Australo to Homo  anymore than habilis was before sediba came along. What it does mean is that we have a whole lot more work to do before a full map of human history can ever be completed. With hundreds of largely unexplored caves and dozens of newly known fossil sites in the Cradle of Humankind, there should be no shortage evidence to keep the bone-hunters busy. See photos of the eight new natural wonders.